What does IP reputation connection drop do and how do I set it up? IP reputation works much like the RBL scanner does, in that it uses a black list, but also has a white list for common mail sources. When used with the SMTP scanner, IP reputation connection drop will temporarily fail messages from sources not found on either list. The temporary fail will allow the sending SMTP gateway to retry, and it will eventually get through. This catches one-time spam bursts from sources not found on the black list, while enabling good mail to still be delivered to the system. The black and white lists are maintained and updated online, but are cached on the local machine as they are used. IP reputation connection drop is superior to Greylisting. This is because IP reputation does selective failing of incoming connections, while Greylisting will fail all incoming connections. Thus, you will see less delays of incoming legitimate mail while still getting spam mails blocked when you use IP reputation connection drop. 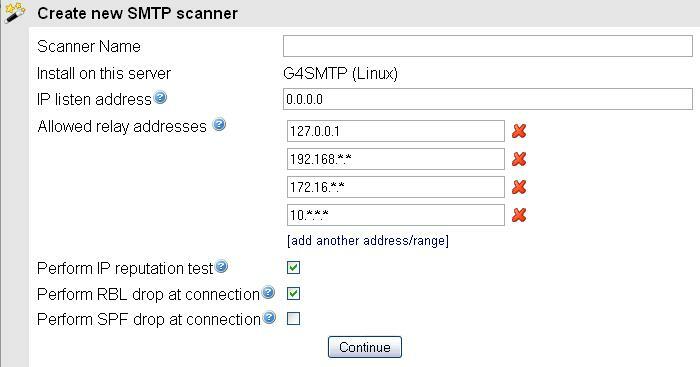 There are two ways to set up IP reputation connection drop; either at the time of installing the scanner or after the scanner is already installed. It is checked by default to be enabled when the scanner is being installed. This article was originally published in the GWAVA knowledgebase as article ID 1214.